News collects all the stories you want to read, from top news sources, based on topics you’re most interested in — so you no longer need to move from app to app to stay informed. Apple clearly wants to create a news environment for their users, which makes it easier to personalize news and accommodate to their own personal preferences. This personalization is a key feature within Apple News, since its system gets to understand the interests of their users, translating this to delivering only those specific stories to their screen that correspond to their preferences. Furthermore, a “continuously updated feed of stories that are collected based on likes and interests” is shown to Apple users, where stories can be shared within their social networks and articles can be stored to read later. The morning Apple announced News, Wired posted this article. In it is explained which different publishing companies Apple had already connected to when it was launched. Wired itself was one of them, amongst others like The New York Times, ESPN and BuzzFeed. Greenberg (2015) states that the app is a reflection of “what digital news consumers today expect”. Nowadays, digital news consumers expect different things from publishing companies then a decade ago. Now that Apple, already a big authority in the field of technology and innovation, intrudes in the field of journalism, their share within this market is expected to increase. Apple News doesn’t create the news itself, but brings the existing news in a great design (which their consumers obviously love) to their readers in a personalized way. The fact that they position themselves as an intermediary form of news makes this development emergent within the field of new media. In the Apple News app, the design of the original news source is combined with the great possibilities of the digital media world. Apple already was one of the leading companies within this world, but now they spread their tentacles to the printing press too, one could imagine their power will only become greater. As shown in the video, for Pariser, the filter bubble isn’t necessarily a positive concept. By creating an environment around a user that is completely adapted to their preferences, one might miss topics that could be interesting for them because they wouldn’t fit within their interests anymore. As a consequence, the ability to look further that the extent of one’s perception is limited. customize their feeds to see news stories from the publishers they like (Greenberg 2015). At the same time, Apple News learns from these settings and interacts with the users by showing them stories “based on what they read” (Greenberg 2015). Apple vice president Susan Prescott refers to this development as smart news, since its algorithm gets better in showing articles which seamlessly fit into the topics that they are interested in (Greenberg 2015). In the past decade, as a percentage, more print journalists have lost their jobs than workers in any other significant American industry (Adams 2015). Apparently, things still aren’t going well in the American newsroom, since digital news is becoming more and more relevant as well as abundant. 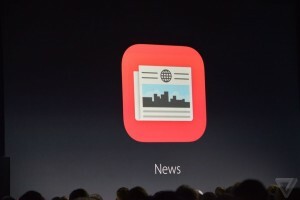 With the introduction of Apple News, publishing companies can approach the demise in journalism differently. However, this article suggests the big publishing companies embrace the development of Apple News. For example, CNN posts everything on Apple News that is put on their site, just like Vox Media, Time Inc. and Wired. This indicates that big publishing companies are taking any opportunity to cooperate with Apple. And to be honest, I’m not surprised, since Apple now has created an app that gives publishing companies the ability to reach out to everyone who owns any Apple device. Making use of modern personalization technologies, Apple News positions itself as an intermediary form of news that has a great influence on the way news is consumed. There might even be a chance that Apple will dominate the printing press somewhere in the future. So, the question that needs to be asked here is what the newsroom of the future would look like if a big company like Apple, that doesn’t have any roots in journalism, would have control over the printing press and encapsulate their users into their own news environment? PS: Since Apple News isn’t available in The Netherlands yet, I’ve added a video from a demo that was shown at the WWDC 2015 conference from which you get a clear impression of how it works like.